The heartwarming animated comedy follows a small but brave donkey named Bo (voiced by Steven Yeun, “The Walking Dead”), who yearns for a life beyond his daily grind at the village mill. One day he finds the courage to break free and finally goes on the adventure of his dreams. On his journey, he teams up with Ruth, a lovable sheep who has lost her flock and Dave, a dove with lofty aspirations, along with three wisecracking camels voiced by Tracy Morgan, Tyler Perry and Oprah Winfrey. Bo and his new friends follow the star and become accidental heroes in the greatest story ever told. 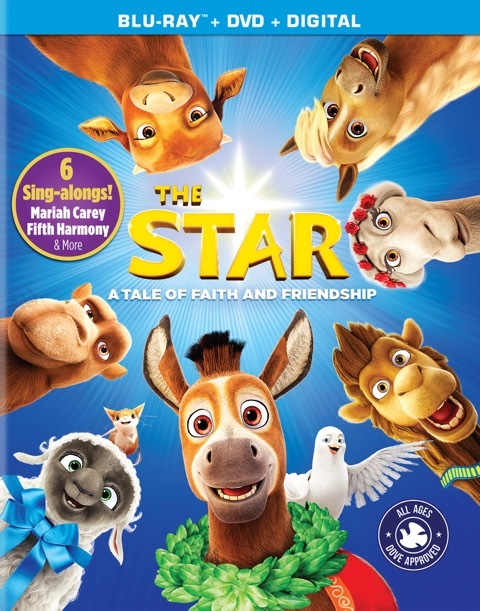 THE STAR is filled with more than an hour of engaging bonus materials including the “Star-aoke: Sing Along with Bo & Friends,” a dance along to “Life Is Good” by A Great Big World, plus a collection of fun lyric videos that will have you singing along to the inspiring music from THE STAR. Families can enjoy crafting and baking with “how-to” videos “Star Mason Jar Votives” and “Sweet and Sparkly Stars,” and they also can go behind-the-scenes to explore the amazing talent who bring these characters to life. In “Faith All Year Round,” renowned pastor and motivational speaker, DeVon Franklin delivers a fun and engaging children’s sermon discussing the themes of the film and keeping the spirit of this inspiring story alive in us every day. Comment below who you would like to watch this movie with and why to enter to win your very own copy! Winner will be selected tonight! I’d love to watch this with my husband & daughter Luna! I would love to watch this with my daughter she loves animals!